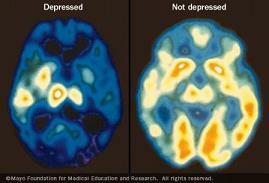 Mental health problems and depression are not normal parts of aging. This page will help link you to resources and information relating to mental health and brain health. The Aging and Mental Health Coalition of Kansas City North now meets quarterly on the 3rd Thursday of the month at Tri-County Mental Health Services, 3100 NE 83rd Street, suite 1001, Kansas City, MO 64119. Call (816) 468-0400 for more information. Tri-County Mental Health Services, Inc. has an Older Adult Outreach Coordinator. Call Becky Franklin at 816-468-0400.